Ferozepur: The Khalra Mission Organisation (KMO) had demanded that the Shiromani Gurdwara Prabhandak Committee (SGPC) should recognise the Sikhs who were subjected to enforced disappearances by the Indian forces during 1980s-90. Human Rights activist Jaswant Singh Khalra had estimated that around 25 thousands Sikhs were subjected to enforced disappearances, killed during such disappearance and were secretly cremated or their dead bodies were otherwise secretly disposed off by the Indian forces during mid-1980s to mid-1990s. He was later subjected to enforced disappearance by the Punjab police and was secretly killed. Bibi Parmjeet Kaur Khalra, wife of Shaheed Jaswant Singh Khalra, who leads the human rights work under taken by the Khalra Mission Organisation (KMO) said that the SGPC should place images/portraits of Sikhs killed in fake encounters or during enforced disappearances. 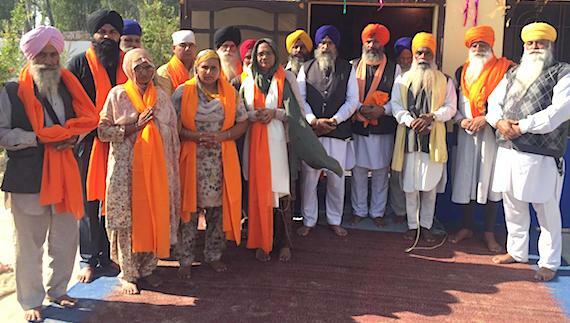 She was speaking during a Samagam held at Gurdwara Neela Taara near Zira in Ferozepur district. She said the Akal Takht Sahib and SGPC should recognise the Sikhs who were labeled as “unclaimed or unidentified dead bodies” by the Indian state.